Every so often you come across a polish that is a rare gem. It's something you never seen before and never knew you wanted until you set eyes on it. 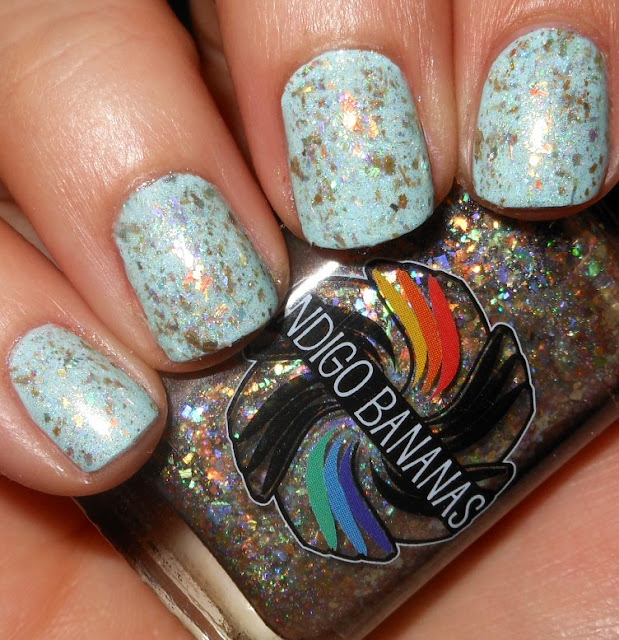 That's how I feel about this Indigo Bananas polish. I never knew a polish like this could exist and it has one of the most stunning finishes I've ever seen. Yep. Mine. I need that! 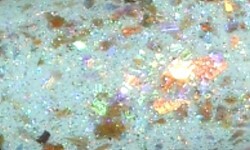 Earth, Wind, and Fire is a crystal flakie mix of gold-copper-green-purple plus linear holographic. Color: What? What? I did not know they made opalescent flakies! These are gorgeous. I love they are golden and that they are color shifting. I don't think I've ever seen a flakie polish like this one ever? If I did I would of swooped it up. These golden opalescent flakies along with the holo glitter give such an amazing effect to nail polish. My nails look like jewelry or something. Formula: Excellent and easy to use formula. I used 2 coats over a base here. Price: You can purchase this in a 15ml bottle for $12 or a 8ml bottle for $7.25. Overall: I wish I had tried this last year. It would have been a shoe in for Top 25 of 2015. This is definitely one of the coolest and prettiest polishes I now own in 8 years of collection polish. Wowee! This is amazing!